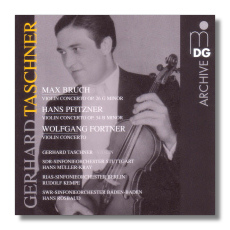 MD&G has done inestimable service to Gerhard Taschner, a rather forgotten violinist who was active in the war-ravaged Germany of the late 1940's and early 50's. We are reminded of his excellence and greatness in this collection of violin concertos which resurrects Pfitzner's rather underrated piece and the modern one by Fortner. Bruch's Violin Concerto is steadily played in quite astonishingly vivid sound and sympathetic support from the Stuttgart orchestra especially in the Adagio and the transition to the breathtaking Allegro energico. The same could be said of the Pfitzner concerto which includes some interesting motifs all along especially in the final expansive, 'Gemachlich' movement. Again the orchestra is extremely supportive, coaxed by the genial Rudolf Kempe in a rare recording from 1955. Finally we have the Fortner Concerto with its biting modernity and rhythmic vitality which is superbly expressed by the genial Taschner. This recording dates from 1950 but it has the equally great Hans Rosbaud at the helm, that master of modern scores. Great stuff then with fine biographical notes and fulsome recordings rounding off a secure recommendation.